PerfectSense ® Paraffin treatments are now available in an exclusive blend that helps maintain optimal skin health through regular hydration, nourishment, and protection. Not just another mainstream paraffin treatment, Nourishment+ combines the hydrating ingredients of the original Nourishment blend with the potent age-defying" ingredients of the Antioxidant blend. With the addition of Swiss Apple Stem Cell, a proven ingredient for age-reducing support, Nourishment + is concentrated formula of enriching quality-driven ingredients that deliver results. Nourishment+ has a beneficial, restorative effect on the skin. The leader in paraffin treatments, Nourishment+ protects the skin against free radicals while promoting cellular renewal, helping to reduce the signs of natural aging. The addition of Swiss Apple Stem Cell protects human skin stem cells and combats chronological aging, producing vibrant and fresh skin. The quest for younger-looking skin begins with PerfectSense ® Paraffin. 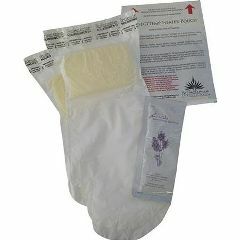 Available in both Hand treatment and Feet Treatment. Ingredients: This unique formula combines Swiss Apple Stem Cell, Grape Seed Oil, White and Green Tea, Vitamins A , C and E, Panthenol, B 12, Soy Lethicin, and Sorbitan Stearate to provide the ultimate in antioxidant and nourishment support.